I just found this website, which I am sure lots of you already know about, but hey, I didn’t, so I am going to share. There have to be plenty of other unaware folks out on the Internet besides myself. Anyway, it is an online book swap. What you do is register on the site, post ten books of your own you are willing to mail to other registered users of the site at your own expense. (Via media mail, which is the cheapest rate–about $2.00 per book, unless it is a hardcover), and for each book you send out that the person who requested it receives, you get a book credit. You also get two starting credits just for posting your ten books, which you can use on any of the books currently posted on the site. You can also make your own wish lists–which means if a book you want is posted, you get a message notifying you of it and you have 48 hours to request the book from the person who posted it. When you get a book request from another member, you can decline the request or accept it. If you accept, you have 48 hours to mail out the book and mark it as mailed. When the person who requested the book receives the book, they mark it as such, and then you get your credit. It is a pretty neat system. I have loaded 23 of my books, and already have one to send out and lots more that are on people’s wish lists. It seems like a lively community of people all sharing books back and forth, and I thought that maybe some of my book-loving readers might want to know about it. 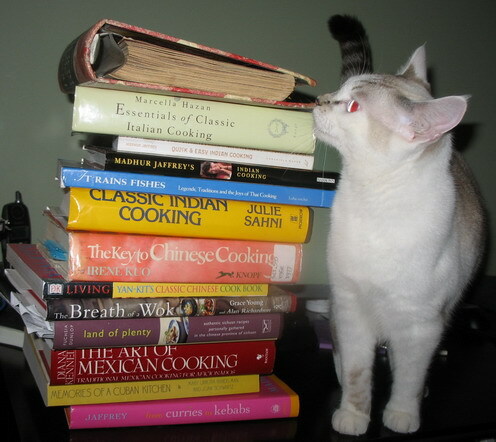 BTW–there are all sorts of books there, including food-related titles and cookbooks. In fact, I just uploaded a few of my own, including titles by MFK Fisher. Anyway, if you are interested, take a look at Paperback Swap. I tries BookMooch, which is a similar site, but I was not too happy with that. There was never a good selection of books to pick from. I’ve had much more luck w/ PBS than BM… just a HUGE selection. I’ve gotten so many books/cds/dvds using the wishlist feature that I never thought I would get. CDs/DVDs – transfer credits through their sister sites SwapaCD.com & SwapaDVD.com. ENJOY! Cd & Dvd swap too! Cool! I got no nibbles from book mooch, I’ll have to give paperback swap a try. Barbara you also might want to try swaptree.com. I have traded several many books on this site. Yeah, how did you miss swaptree.com? Brilliantly innovative new website that is the gold standard for swap sites. My favorite new site on the web. Amazing! Just wanted to say thanks for the paperbackswap tip. I joined and LOVE it. I’ve sent off 5 books already and am due to receive 3 any day now. Now I know what to do with all my books in storage.